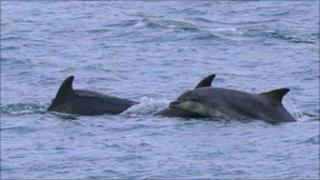 A pod of more than 100 bottlenose dolphins have been spotted off the coast of the Isle of Man. The first sighting, from John Galpin at the Manx Whale and Dolphin Watch, was on Monday at 0930 GMT off the island's west coast, near Dalby. Subsequent sightings at the Sound confirmed the pod was travelling towards the south coast. At the Sound the dolphins were split into four distinct groups including juveniles and calves. Common bottlenose dolphins are widespread, except in polar waters. They are extremely sociable and sometimes hunt their prey in teams.